Every business is different. 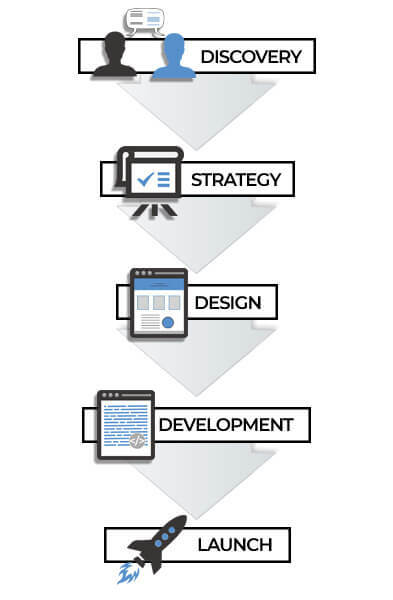 We believe a successful website should be designed specifically to meet the unique needs of each client. This is why every website is built from scratch. NO themes, NO templates, NO shortcuts, 100% custom development. We work with business to design a strategy for how online activites can improve their business and then develop a website capable of meeting those objectives. Every project begins with a discovery session. We discuss your business, current objectives, long term goals and how we can help to achieve them. The strategy to achieve these objectives is then designed, we explore what digital platforms are required and develop the site structure and content. The design phase of the project is where your website comes to life and a working prototype is produced. You are now able to see how your finished website will look and test the user interface to make sure it operates as needed. The development phase is where the code is written to turn the prototype into an actual website. And, based on project requirements, integration with other systems is completed. Your new website is then launched, ready to improve the ROI of yout digital expenditure. Are you ready to increase sales and reduce operating expenses? Request your discovery session today to find out how a bespoke website can help your business.